17 seconds is all it takes to filter a 40 mg/L* OPR and achieve 98% recovery. That’s 50 times faster than a typical single layer SPE filter with 89% recovery. In addition, triple layer Xenosep SPE Filters have 5 times the filtration capacity already built-in for the MS, MSD, and hard-to-filter samples. Less filter clogging enables more efficient filter drying and eluting with less solvent. Xenosep sodium sulfate columns save time by eliminating off-line drying steps or repouring the extracted water sample back into the separatory funnel. Less extraction solvent means faster distillation. Final hexane extracts distill to dryness in about 10 minutes. 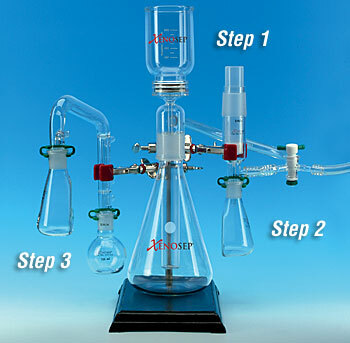 Unique flat sided Xenosep flasks reduce oven drying times by 67% so you get QC tests in the dessicator 3 times faster than the other options below. Extract-Elute-Dry 8.8 min. 26.5 min. 46.0 min. Distill-Oven Dry 21.0 min. 50.0 min. 60.0 min. Time to Dessicator 29.8 min. 76.5 min. 106.0 min. Estimated Labor/Batch of 20 4hrs. 6 hrs. 8 hrs. Xenosep Labor Savings/Batch 2 hrs. 4 hrs. Xenosep SPE Systems for performing EPA Method 1664A are available in convenient Starter Kits for laboratories just starting out. 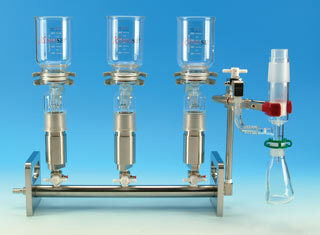 Starter Kits include all components required to process one sample at a time. Additional components are available for scale up as required. Xenosep Manifold Kits are available for a three position manifold and include components necessary to process three samples at a time. 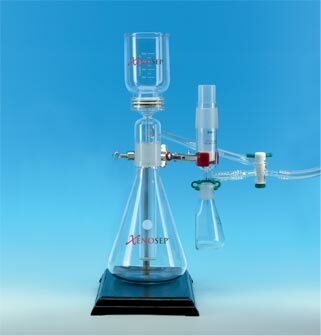 If your laboratory has existing glassware or manifolds, please visit our web site at www.xenosep.com or call 1.866.936.6737 for assistance. © Xenosep Technologies LLC, 2005.